1:9,500 scale Participatory 3D Model (P3DM) of of Mutton Hole Wetlands, formally part of a private cattle station to the North of Normanton but now owned by the Queensland Government and managed by the Department of Parks and Wildlife, Australia. 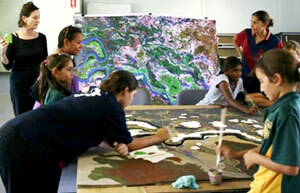 The model measuring 1.7m x 1.7m (200 km2 on the ground) is the 1st Participatory 3D Model constructed in Australia and was completed in April-May 2009. 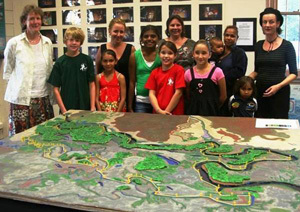 This model was made as a first step in the community consultations that Northern Gulf Resource Management Group and Carpentaria Shire Council want to have with the Normanton community about the future conservation and use of the Wetlands. Participants in the exercise included 89 local inhabitants of Normanton including Indigenous elders, parents and youth, farmers, business owners, teachers and Indigenous rangers. 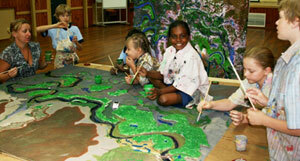 Since mid-May 2009 the model has been displayed at the Normanton Visitors Information Centre and on Thursday 21st May there was a formal public opening when students, parents and interested community members came to see what the schools had been working on. The exhibition was opened by Vicki Jones of Northern Gulf, along with Isla Grundy of CSIRO and Agnes Hughes from Normanton State School. The forty or so people who attended were able to take a closer look at the model and discuss wetland history and potential use. The community at large was invited to give it’s opinions and ideas on how the Mutton Hole Wetlands should be managed and used in the future through individual community consultations and group discussions held at the Information Centre. 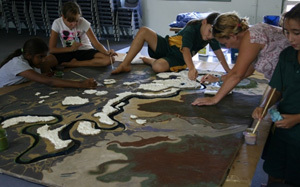 The exercise was made possible by the coordinated effort made by Normanton State School and the Gulf Christian College, working together with Dr Isla Grundy of CSIRO in Cairns.